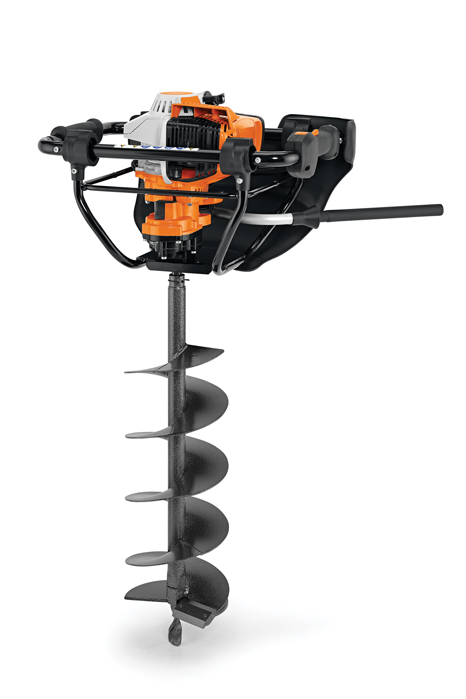 The STIHL BT 131 earth/ice auger is a high performance and lightweight tool professionals need for post-hole digging, fence installation, large planting projects, environmental restoration and construction projects. Featuring a powerful, fuel-efficient engine and a larger fuel tank than previous models, this auger works longer with fewer refuels. It also features a vertical pleated air filter for improved air supply quality and extended service life. Its semi-automatic choke lever enables a simplified starting procedure that reduces the chance of flooding, while the STIHL Quickstop® auger brake is designed to automatically stop the auger bit from turning if it hits a hard underground impediment. With an ergonomic design, the BT 131 delivers control and comfort while reducing fatigue. Using an optional STIHL ice auger bit, this auger is ideal for ice fishing and professional applications such as construction in icy conditions. Don’t miss out on this auger that combines power and performance. LONG-LIFE AIR FILTRATION SYSTEM: The long-life air filtration system helps reduce the need for frequent filter cleanings. STIHL QUICKSTOP® AUGER BRAKE: This braking system is designed to stop the bit from digging when the auger hits a hard underground impediment. In addition, the STIHL QuickStop® drill brake acts to stop backwards rotation. A jammed drill bit can simply be unscrewed from the borehole. HIP PAD: The hip pad is positioned close to the body or leg of the operator during use for more comfortable operation. VIBRATION-DAMPENING SYSTEM: This advanced vibration-dampening frame increases user comfort and helps reduce operator fatigue, especially when used over long periods of time.